Today guys I bring you a Jamaican vegetable soup that is bursting with all the Jamaican flavours. You will love this flavourful soup that is ready in under 1 hr. 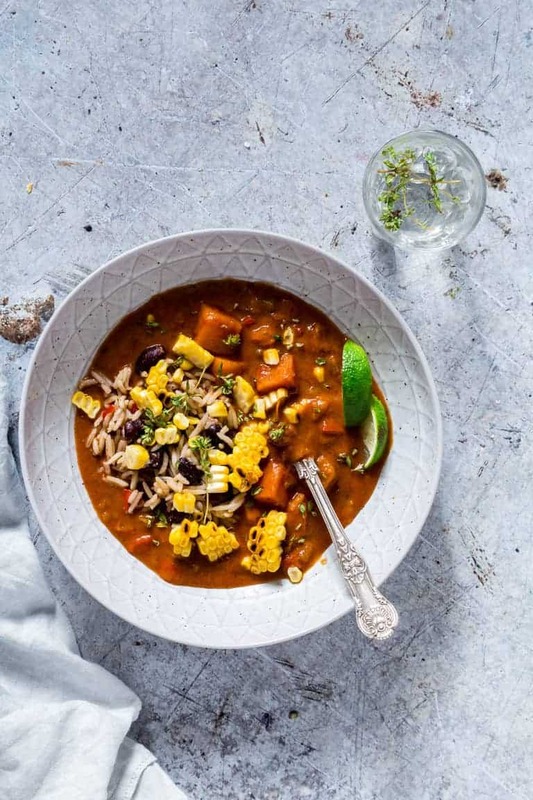 When I say Jamaican vegetable soup, I mean a soup bursting with all the Jamaican flavours (that I loooooooove) aka the well-known rice and peas, orange sweet potato, fresh thyme, allspice, peppers and chilli. And to top it all off some hot and fresh off the grilled sweetcorn, sliced off the cob and straight into the soup. Yeap, aaaaaaaaaaaaaaaaaall the flavours that I love. I really like the textures and contrasts in this soup. 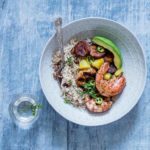 Every spoonful is a burst of flavour between the creamy melt in your mouth sweet potato, the mild coconut rice and peas, the warming spices and the slightly chewy and little bit charred sweetcorn. And if you squeeze some lime over your soup, it then adds in a whole other flavour profile. I actually meant to call this a Jamaican rice and peas soup but since it is loaded with load of other veggies too, I decided that Jamaican vegetable soup explains it sooooooooooo much better. What do you think? Store leftover food in these handy bowls. Grill the sweetcorn and cut of kernels. Fry the onion, celery, pepper, sweet potato, bay leaf and a couple of tbsp. water and sauté the onion is softened. Mix in the ginger and garlic followed by the paprika, allspice and scotch bonnet chilli. Then stir in the hot vegetable stock, tomato and thyme, bring to the boil, cover and reduce to simmer until the sweet potato is cooked. Serve the soup with sweetcorn kernels. 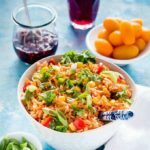 This recipe is a perfect way to use up any leftover rice and peas that you have in the fridge. Whilst I have used sweet potato you could easily substitute in some pumpkin or various other squashes that you have and also feel free to add in a few extra vegetables to your taste. It is really flexible. Veggies I have added in include spinach, plantain and I have also served it with some warm toasted cornbread. It all works so test and try away. It’s naturally vegan and gluten-free. For more soups why not check out my soup below. 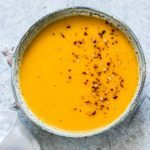 Instant Pot Butternut Squash Soup. Low Carb Instant Pot Cauliflower Soup. Healthy Roasted Butternut Squash Soup. Vietnamese Pho Chicken Noodle Soup. 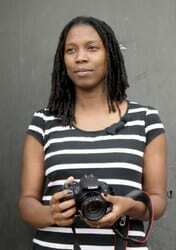 Thank you for reading my Jamaican vegetable soup recipe post. And please come visit again as I continue dreaming up recipes, traditional African recipes, African fusion recipes, Sierra Leone recipes, travel plans and much more for you. 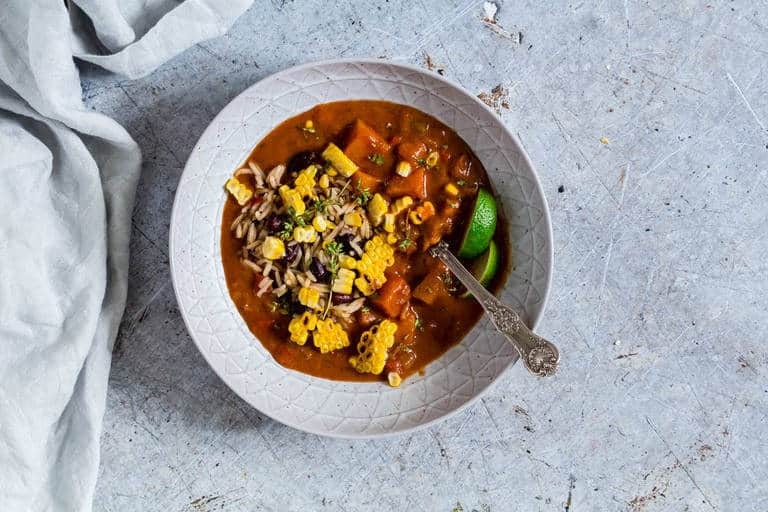 Don't forget to tag #recipesfromapantry on Instagram or Twitter if you try Jamaican vegetable soup! It is really, really awesome for me when you make one of my recipes and I'd love to see it. You can also share it on my Facebook page. Please pin this recipe to Pinterest too! Thank you for reading Recipes from a Pantry. Heat the oil in a pot over medium heat and add in the onion, celery, pepper, sweet potato, bay leaf and a couple of tbsp. water and sauté for about 10 mins so the onion is softened. Mix in the ginger and garlic and stir for 30 sec until fragrant, then stir in the paprika, allspice and scotch bonnet chilli. Then stir in the hot vegetable stock, tomato and thyme, bring to the boil, cover and reduce to simmer for 35 mins or until the sweet potato is cooked through. Then check the seasoning before switching off the heat. Just before the soup is done, preheat the grill to medium and grill your sweetcorn for a few mins on each side till they are starting to char. Switch of the heat, slice the corn of the cob and set aside. 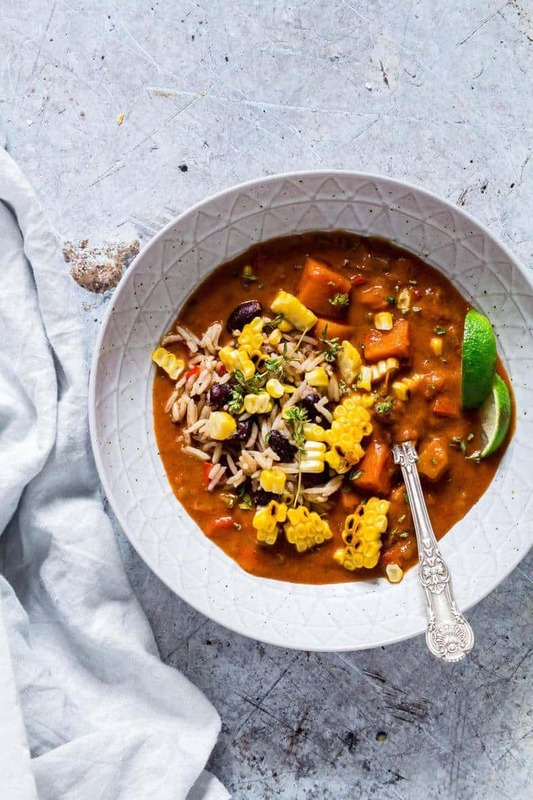 Ladle the soup into bowls, then top with some warm coconut rice and peas followed by some sweet corn, add the garnish and serve. Squeeze lime over the soup for the best flavour. This looks like a super comforting soup and it is making me miss Jamaica. Such an awesome place with the BEST food. The flavors in this sound so yummy!! 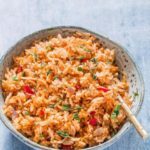 Jamaican dishes are known for this sweet and spicy and I love it! 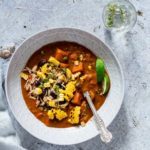 I think Jamaican Vegetable Soup is the perfect name, and it sounds SO good! I miss Jamaican food. I can’t get it anywhere here where I’m at now, but I grew up right next to a fabulous little Jamaican place in FL. with the cooler weather, I love making soups. Will definitely need to try this one. What a perfect soup for this cooler weather! Love the combination of ingredients, yum! What a great way to bring Caribbean sunshine into our kitchens! I love the addition of grilled corn, too. wow – what a hearty and wholesome bowl of soup! Ah, this looks perfect! I love my soup jam-packed with veggies. Can’t wait to try this recipe! Great job Bintu, that looks STUNNING!! !